The floating structure of iron, containing a large covered swimming-bath, moored in the river just above Charing-cross Railway Bridge, was opened for use, without any ceremony, one day last week. It is placed almost close to the railway bridge and adjoining the Victoria Thames Embankment, in one of the recesses of the granite wall, which was formerly occupied by one of the floating steam-boat piers. This is the first of a series of floating baths which it is intended to establish at various points, not only along the course of the River Thames through London and elsewhere, but likewise on other rivers wherever such accommodation may be required. 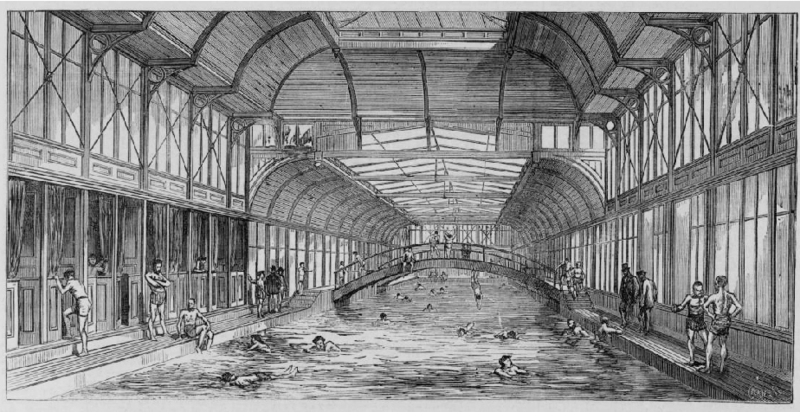 A word must be said for the energy and enterprise of the Floating Swimming-Baths Company (Limited) of which Admiral Elliott is chairman and Mr. Page is the active secretary. The difficulties which beset every novel undertaking have met the promoters of this design in the most aggravated form; and that it has become a realised fact is due to the unremitting exertions of all employed, and to the public spirit and courage of the directors. The bath, now open, was designed by Mr. E. Perrett, of Abingdon-street, Westminister, the company's engineer. It is of wrought iron, with a superstructure of wood, iron and glass in combination. The hull or lower portion was constructed by the Thames Iron and Shipbuilding Company (Limited). 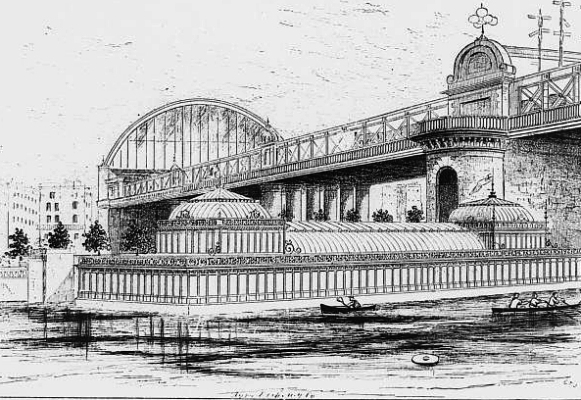 It is composed of two longitudinal side-box girders, connected together at the ends and bottom by iron plating and suitable iron framework, and in the central portion by two arched girders over the bath, having the appearance of bridges, and affording raised perches for divers to jump off. The end parts of the structure are partitioned off from the bath by bulkheads, and form respectively the machinery-chamber and a chamber for the storage of what is required for a refreshment-room. These end chambers are each 21ft. long, in the longitudinal direction of the structure, and 25 ft. wide. The bathing space is 135ft. in length and 25ft wide. The minimum depth of water is about 3ft. at one end, the wooden false bottom sloping down from the eastern end for a distance of 90ft., where the full depth of the water, about 7ft. is reached, continuing to the western end. For the purpose of warming the water, at the commencement and end of the bathing season, a heating apparatus is provided at the eastern end of the bath; this is fired from the machinery chamber, which is at the end. The superstructure is of a light though substantial character, and is relieved at each end of the bathing space by a dome, beneath which is placed a fountain; and through these fountains the water is supplied to the bath. footnote: In 1885, an attempted sale by auction failed to meet the asking price, and later in the year the baths were purchased by the South Eastern Railway Co. and scrapped. Another short-lived floating baths appeared near Somerset House c. 1891 - an 'eyesore' which the LCC outlawed in 1892.